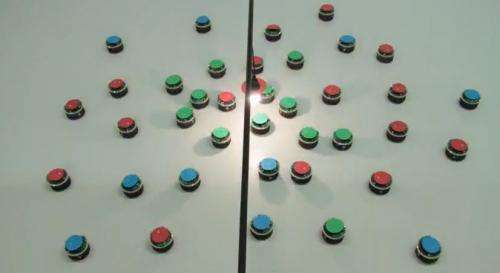 Dr Roderich Gross, head of the Natural Robotics Lab, in the Department of Automatic Control and Systems Engineering at the University of Sheffield, says swarming robots could have important roles to play in the future of micromedicine, as 'nanobots' are developed for non-invasive treatment of humans. On a larger scale, they could play a part in military, or search and rescue operations, acting together in areas where it would be too dangerous or impractical for humans to go. In industry too, robot swarms could be put to use, improving manufacturing processes and workplace safety. The robots were showcased on Channel 5's The Gadget Show this week and will be demonstrated at this year's Gadget Show Live, to be held at the NEC in Birmingham from 3-7 April 2013. It will be Interesting to see them play a popular Song hitting keys of a Musical organ...They have to be fast enough...and at the same time should not get in the way of a fellow-robot; Nice to see them carry a specific letter of alphabet and also symbols if needed on their backs. May be they can use multiple robots with same letters if needed so as to give time/rest to the other. In such as a case such groups should carry their own colors. There are awful lot of colors to choose from, of course. I's be more impressed if he programmed them to march together. That's really all you can do with them. They're just robots. a crude version of the Crichton book "Prey"
So many Robots all the time. All these are directly useful to the common man only in the distant future. Every one now a days is facing the Monitor Screen much of the time. Mosquitoes are biting the feet & legs relentlessly. So, Micro Robots should be around there....looking for a Mosquito...Snap it & Send the image to the Monitor Screen exactly when it is nearest to the body...Varities of Pictures at various angles, sizes should momentarily appear on the screen & aid the humans! Chemicals are useful but NOT good for body. Others are Expensive, single-use items...which are not practical for everyone. Keeping the house doors closed, screened windows..yes, Help....but only minimize the problem. Drastic measures to contain completely will be a head-ache. Scrolling Ants can be removed...but Flying insects....Forget it!